All just another day in Serge Storms' sun-splashed paradise! When a new digital scheme goes horribly awry - causing innocents to die and a young woman to go missing - only one person can set things right: obsessive Florida trivia buff and reluctant serial killer Serge Storms. Aided by his perpetually addled sidekick, Coleman, and latter-day noir private eye Mahoney, Serge launches a crusade to rid his beloved state of predators and save the girl. But Serge's mission is hampered by one pesky little detail: He's being tracked by a hit man dispatched from his murky past. And all bets are off when Serge learns the same assassin is responsible for killing the love of his life years ago. It's not long before the two begin tracking each other around Florida in a frenzied Mobius loop. It's a dance only one can survive - it's the Tiger Shrimp Tango! As always, Oliver Wyman reads the hell out of Serge A. Storms' latest epic adventure. Nobody does Tim Dorsey better. This isn't Shakespeare, except for his comedies. Would you consider the audio edition of Tiger Shrimp Tango to be better than the print version? Once one gets used to Serge Storm's character from other books, this one moves fast and in very unpredictable ways . (Just like Serge). Any of the scenes involving Serge's "experiments" and his potential escapes. To laughter, yes, emotionally -- its not one of those touchy feely books. This was a GREAT book to listen to while on a caribbean beach with wind and water and fresh warm air. Serge trying to find a middle ground between the Tea Partiers' and the Occupiers, you can guess how well that works. Johnny Vegas, the Accidental Virgin has a couple of appearances, and Serge wiping out an organized group of criminal scamers in his own special way. If you are a fan of Dorsey, what more could you ask for. I like the older stories and performance much better. This seems to be a retread. this was my first audiobook in regards to the Serge series and I have to say it was difficult to adjust to the nasally voice of Serge. But the voice actor for this book was so incredibly talented. I mean everybody else's voice other than Serge was just fantastic to me. I think I just had a hard time adjusting because I read 7 volumes and created Serge's voice in my head. Even though the voice didn't match up and that was probably the most difficult part, the voice actor was incredibly committed to the character which brought Serge to life in my eyes or should I say my ears. I guess that's why I really enjoyed listening to this book because it was closer to a drama than a standard audiobook. if you're a fan of the Serge series and you're teetering like I was for months, that's not a joke, then I highly recommend this book. I caught myself laughing more than once it's a pretty amazing with a stellar performance. I am always mortified, amazed and can't help but laugh hysterically when devouring another Serge episode. Tim Dorsey is a consumate (albeit sicko) story teller. Yes, even if a person knows nothing about the early days of Carl Hiaasen they will love this book if they have ever been to south Florida. 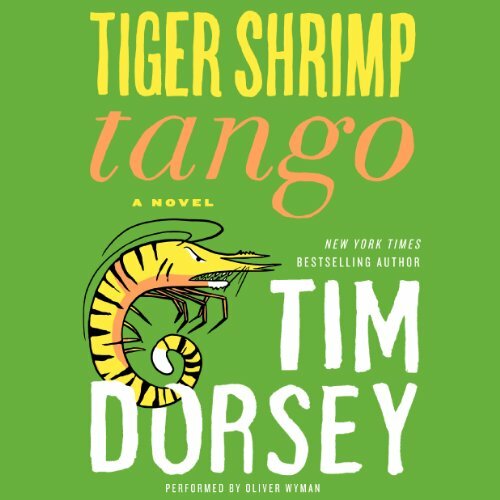 What other book might you compare Tiger Shrimp Tango to and why? His voice changes are wonderful! I did it over a two day road trip and was sad when it ended. Oliver Wyman is excellent - as usual. This listen ranks right up with the better Dorsey books. Glaring error alert: If Serge is such an expert on Florida and all things Floridian, then how in the world did he not know what cooter was at the restaurant? . This was my first book on audible. I was Unable to listen to this story because it kept skipping every 30 seconds. Not sure if it wast he book or problem with my download. Very dissapointing.